Wash the fresh produce. Devein (if necessary) and pat dry prawns with paper towel then add to a bowl. Peel and crush 1 garlic clove, thinly slice the remaining cloves. In a small food processor, add the chili, crushed garlic, coriander stalks (reserving the leaves for garnish) and blitz together (or chop by hand). Add the juice of half the lime and the fish sauce, then pour this over the prawns. Peel and mince the ginger. Cut off and discard the roots of the spring onion; thinly slice. Slice capsicum into thin strips, discarding seeds. Thinly slice the water chestnuts. Heat oil in a high sided pan (or wok) over medium heat. Add the ginger, sliced garlic and spring onions and cook for 1 minute. Add the capsicum and cook for 1 minute, until the capsicum starts to soften. Add the water chestnuts; toss together. Add the soy sauce and a really good grind of black pepper, then tip the lot into a serving dish or plate. Heat a medium pot of salted water to boiling on high (for step 4). Heat oil in the same pan (or wok) and add the prawns, lifting them out of their juices. Toss for 2 - 3 minutes until they turn pink and are cooked through. Add the marinade and swirl the pan (or wok) quickly, then tip the lot onto the cooked veg from step 2. Add the noodles to the pot of boiling water. Cook 2 - 3 minutes, or until tender. Drain thoroughly and rinse under warm water to prevent the noodles from sticking together. Sprinkle over the coriander leaves and a squeeze of half the remaining lime. 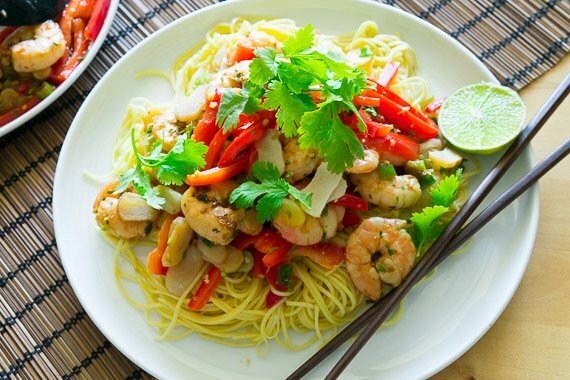 Divide prawn stir fry and noodles between plates. Serve with remaining lime for squeezing over. Enjoy!